One of the joys of eating out is the complexity of the dishes on offer. I love to cook and bake but it’s not often I’ll take the time to make the numerous reductions, drizzles and sprinkles that often adorn a single plate. In a small seaside town in Le Marche there’s a restaurant (one of my favourites in the world) where they deconstruct tiramisu into something almost unidentifiable and utterly delicious. Each element of this dessert is so intricately perfect, I’ve often wondered about the work that goes into it but never attempted to make it myself. The recipe remains elusive, placed on a pedestal and perhaps all the more enjoyable because of it. Other restaurant desserts are a little less complex, offering inspiration in the form of unusual flavour combinations, ingredients or textures. A couple of weeks ago we visited the Michelin starred Harwood Arms to belatedly celebrate my Mum’s birthday. My dessert was delicious, but made up of surprisingly simple elements, so with blood oranges still in season (just), I decided to have a go at making it myself. I’ve been on a bit of a coconut oil kick lately, using it successfully in this hot cross loaf and various savoury recipes. While I love the rich, buttery flavour of, well, butter, I was intrigued to see how coconut oil would work as a substitute when dairy is a dominant flavour, as is usually the case with financiers. The original Harwood Arms dessert featured a moist, buttery almond cake, yoghurt cream, blood orange ice cream, segments and toasted flaked almonds. My version substitutes coconut oil for butter, resulting in a cake that is soft on the inside and crisp round the edges when warm, turning into something more dense and slightly chewier when cooled. The blood orange ice cream is substituted with granita (which felt like a better fit with the coconut), the sweetness balanced by a sharp yoghurt cream and the crunch of toasted nuts. This isn’t an exact replica of that Harwood Arms dessert, but it’s a perfect example of why I love eating out and trying new things. The combination of ingredients is one I’d not necessarily have thought to try (generally opting for a simple scoop of ice cream or cream on the side of a cake) and the result is both delicious, and different enough to call it my own. 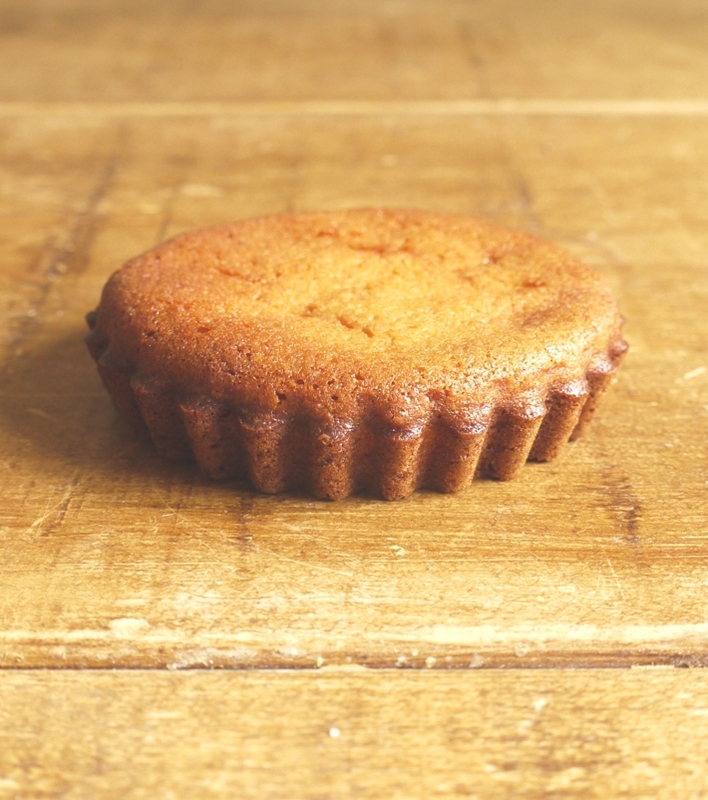 I think these little cakes are best when still slightly warm – soft in the middle and crisp round the edges. If you leave them to cool, they still taste good but take on a slightly strange – but not unpleasant – chewy texture. In a medium saucepan, combine 25ml of the blood orange juice with the brown rice syrup and warm gently until the syrup is completely dissolved. Stir in the rest of the juice then chill in the fridge for several hours (or overnight). Pour the mixture into a container and freeze until icy around the edges. Use a fork to break up the ice crystals then return to the freezer. Fork up the crystals every 30 minutes or so for 2 hours then your granita should be ready. Whip the cream until soft peaks form, being careful not to overwhip or it will become too stiff. Fold in the yoghurt and vanilla extract then refrigerate until ready to serve. Preheat the oven to 220 degrees C. I used individual non-stick tart tins but if you don’t have any, grease a twelve hole muffin tin or line with silicone/paper cases. Melt the coconut oil and honey together then set aside to cool slightly. In a separate bowl, whisk the egg whites with a pinch of salt until slightly frothy (but nowhere near meringue stage). Sift in the sugar and flour, gently folding to combine. Add the ground almonds and fold again. Pour in the melted coconut oil mixture and stir to combine. Divide the batter between your eight tart tins (or twelve muffin cases), tapping gently on the worksurface to flatten the tops. Bake for 5-6 minutes before turning the oven down to 200 degrees C and bake for a further 6 – 8 minutes. Turn off the oven and leave the financiers in for a further 5 minutes or so to firm up then remove and allow to cool in their tins a further 5 minutes. Place cakes on individual plates. Top with a spoonful of yoghurt cream, some icy crystals of granita and a few flaked almonds. Serve. 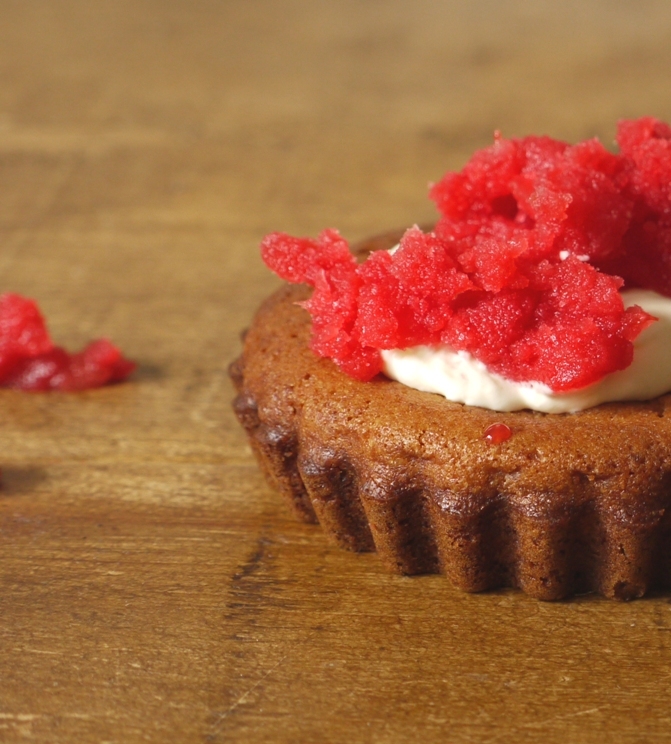 both the financier tarts and the granita sound fabulous! I tend to sub all butter with coconut oil and sugar with rice syrup so this is definitely on my list to try! In a bid to be helpful rather than annoying, there’s a typo in your post – dairu instead of dairy! I actually googled dairu because I thought it was a fancy baking term I hadn’t heard of (never having made financiers!) thought you would want to know! That aside, these look incredible – so buttery (yet not buttery!) I’ve still never made blood orange granita, really must get on it one day…and I too love to recreate some of the more simple restaurant desserts, it’s so satisfying when you have enough cookery knowledge to be able to! I’m like you – sometimes I try to recreate a dessert at home (or, at least, elements of it) but other times I like to think of it as a bit of culinary magic and not try to work out how the chef made it! This is a really lovely combination of flavours so I can see why you tried it, love the idea of a granita alongside a cake too. I have read your post about the place in Le Marche a few times and it sounds absolutely wonderful – might have to convince the boyfriend to go on a little roadtrip at some point! And yes, while I love recreating restaurant dishes, sometimes it is just not worth it when special equipment and very unusual ingredients are required. Besides, it is not actually that hard to create a stunning dessert at home that doesn’t require lots of different reductions, syrups, infusions, sponge squares etc. Love the idea of this dessert – the blood orange granita must be incredibly against the yoghurt cream! Am intrigued by the financiers as well – still haven’t gotten round to baking a batch, although after making some ice cream this weekend, I have 6 egg whites begging to be turned into financiers. I once made granola with coconut oil but found the taste of the coconut oil overpowering, am intrigued to see what cakes made with coconut oil taste like! I think a road trip is a must! As for the financiers, these do taste strongly of coconut which I like here, but for proper traditional financier flavor I’d say try baking them with butter first! I bought a jar of coconut oil several months ago and I still haven’t opened it. I will definitely open it to make this! What a wonderful recipe. Coconut oil is in short supply here, but I’m going to London and will get some there. I made financiers recently and was impressed with their simplicity and deliciousness. On the other hand, I have a terrible aversion to Michelin starred restaurants. They epitomise the misplaced importance that is currently attached to all things culinary. The joy and the reality of the Lyons “meres” needs to be resuscitated. Financiers are wonderful aren’t they? As for Michelin starred restaurants, this one definitely deserves the time of day. It started life as an incredible little seaside trattoria and the chef and owner have grown and developed the menu into something wonderful, but still grounded in its roots. Michelin may be an outdated and strange establishment, but regardless of that or not, this restaurant really is an incredible place which holds some fantastic memories for me. What a great idea these financiers with that gorgeous looking granita! I love your take on this dessert. Did you consider using desiccated, ground in the food processor, instead of ground almonds? I am a huge fan of almonds but wonder how this would work, given your brilliant suggestion to use coconut oil. It would of course change things significantly and I am not even sure if you can use coconut in this way but am intrigued! Thank you for the inspiration. I will let you know if I try it out. Oops! Missed the word coconut! The coconut oil I used gave a pretty strong coconut flavour anyway so dessicated coconut instead of almonds would make these SUPER coconutty – depends what you like I guess. I also wonder whether the coconut would keep them as moist as ground almond… interesting. If you try it I’d love to know how you get on! Ahh you’ve beaten me to it. I’ve been meaning to try coconut oil in baking for a while and was actually thinking financiers would be a good one to try it with. I’m now intrigued with the “odd” texture when they go cold. I call them friands as this is the term I was introduced to them by, but I have no idea where that that name comes from. 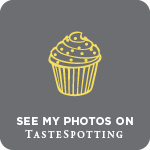 Your photos look as fabulous as ever and I like the way you’ve baked your friands / financiers in tart cases. How lovely – your financiers look perfect out of the mold! I love the rich golden color and the idea of using coconut oil, even if it resulted in a slightly different cake. I’ve been curious to bake with it myself. Thanks for inspiring me! Using coconut oil instead of butter in financiers! So brilliant Kate! I´m in love with financiers again and coconut sounds amazing. I made tangerine sherbet last week and it turned out more like a granita. Love the color of yours! The blood orange colour is so beautiful isn’t it? Wish I’d made a double batch! You once again succeeded in creating a beautiful dessert. Oh how hilariously serendipitous- yesterday morning I posted ricotta donuts with blood orange and yoghurt panna cottas- inspired, would you believe, by an amazing dessert at….The Harwood Arms. Haha, snap! It was such a good dessert 🙂 Heading over to check out your recipe now. This looks beautiful! I love that you made it with a granita, I have always been curious about those but haven’t tried one yet. I need to get on that, though, after looking at this. Plus blood orange season is almost over! Need to get on this STAT. I once paired an apple fig tart with green apple ice…and it was such a revelation. This is how I feel about your beautiful coconut financiers with the blood orange granita…it’s perfect! I’m so craving this now! Apple fig tart with green apple ice? Sounds utterly wonderful. This looks like everything I love in a dessert in one! How delicious and beautiful! And I too am clinging onto blood orange season. Will be very sad when it’s over!! This looks delicious! 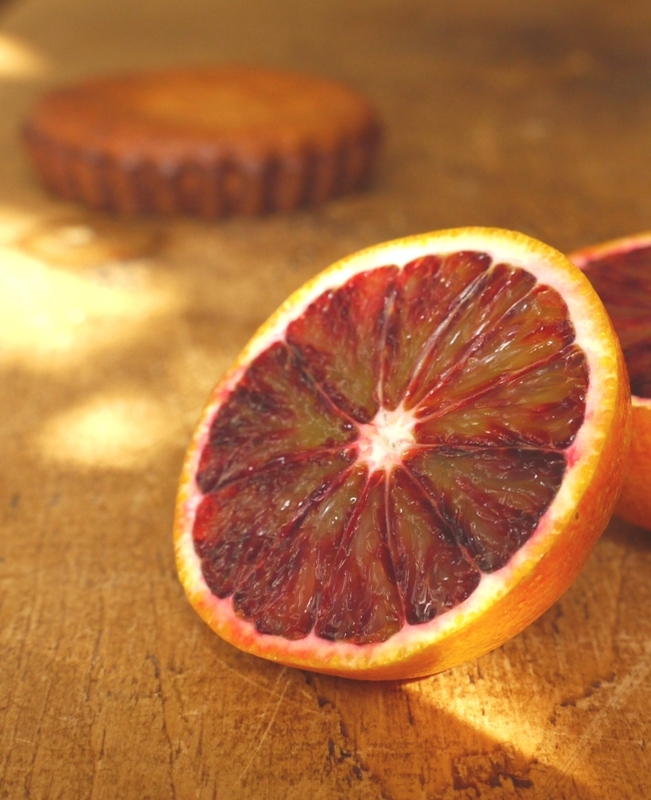 I love blood oranges. And, every once in awhile I try to recreate some dessert; it always feels so good to make it right (or better!) at home. Thanks Sarah. 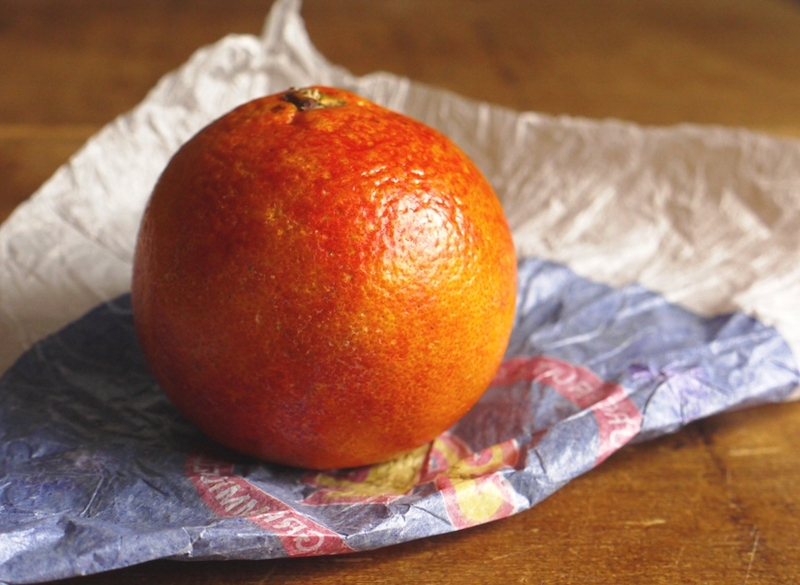 I’ve seen some stunning blood orange recipes on your site – you capture the colour and essence of the fruit so beautifully. Yummy and cool, perfect for summer. I liked how you serve it with granita. Perfect recipe to enjoy orange. I like the look of your financiers and as luck would have it I have some blood orange granita in the freezer. Might try with butter, one of my children a bit funny about coconut! I’ve not been to the Harwood arms for ages now but I do remember the excellent food there. I love having restaurant desserts for the same reasons. Yours looks amazing! I’ve never actually made financiers – they are on my ever growing to bake list. This is such a stunning dessert, it sounds amazing too! I’m so behind on my blog-reading, unfortunately. Sigh. I’ve missed some good ones over here, and this particular dessert is just so well composed. I would love to be faced with this after the end of a nice meal. It’s all been said: but I suppose that’s only to be expected with a winning combination like the yummy scent of coconut oil and that striking, bright blood orange! Gorgeous. Looks like a great combination. I’ve been playing with financier recipes and wondering about coconut oil. Shuna at eggbeater has a coconut financier that uses butter, but desiccated coconut instead of the ground almonds. I think financiers do still taste better with butter (especially as you can brown it for that lovely nutty flavour), but coconut is a very interesting alternative and gives them a lovely texture too. This looks fabulous! I don’t have a huge sweet tooth, and this dessert looks right up my alley. 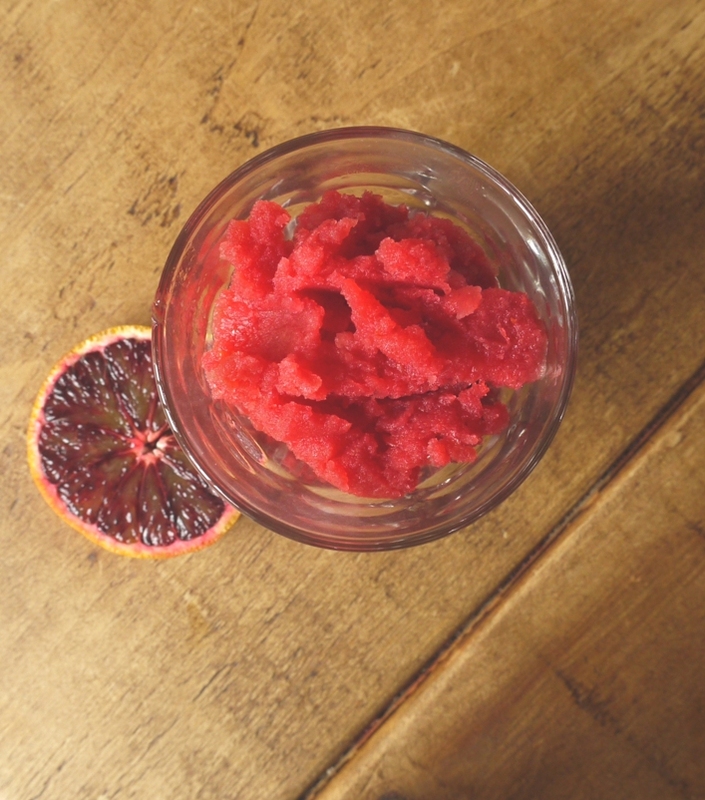 The blood orange granita will be a must try! !